Back in July, our post on Horace Vernet mentioned that, because his father and grandfather had apartments in the Louvre, Horace enjoyed the rare privilege of being born in the Louvre. Today is the birthday of both his father, Carle Vernet, and that grandfather, Joseph Vernet. (Joseph was born in 1714; his son was born exactly 44 years later.) It only makes sense, then, that we devote today's post to Joseph and Carle Vernet. Thanks to Vernet's dedication to his craft, he was the most famous and successful marine painter of his day. He even received at least two dozen commissions from the king himself, Louis XV. Today, in Vernet's hometown of Avignon, there is a Rue Joseph Vernet to honor the artist. Unlike some other artists' children, Antoine Carle Vernet didn't make a career painting the same scenes as his father. 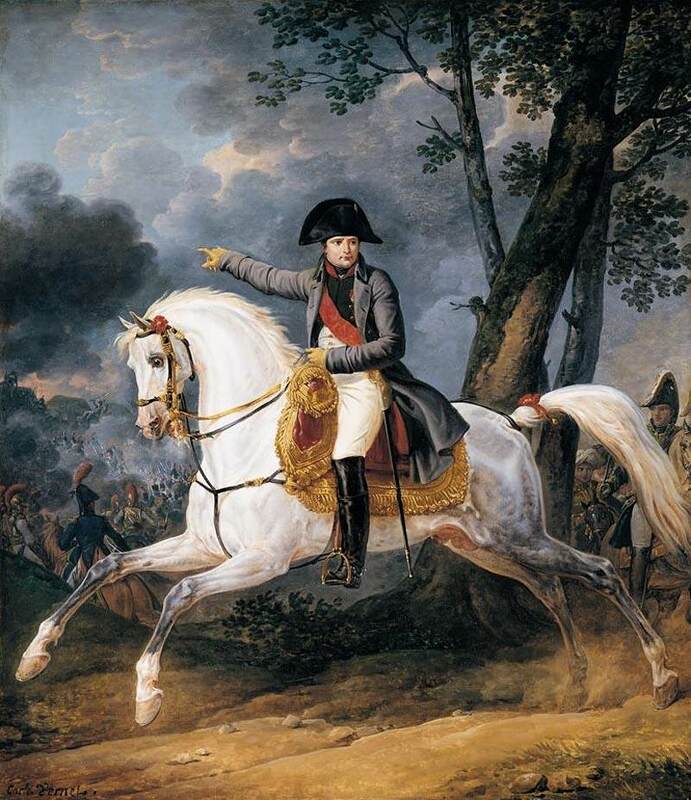 Instead, he made his name with battle scenes, equestrian paintings, and portraits of the emperor, Napoleon. This particular portrait, "Equestrian Portrait of Emperor Napoleon I," was given to General Anne Jean Marie RenÃ© Savary by Napoleon. The general, who was the Duke of Rovigo, was one of Napoleon's longest-standing supporters, being one of the last to desert the emperor at his abdication in 1814. Carle Vernet began studying art at age 11 and won the Prix de Rome at age 24. His stay in Rome ended prematurely, though, when his father recalled him to France to prevent him from entering a monastery. Apparently, he had undergone a "mystical experience. " During the Revolution, his sister was guillotined and, while many sources state the tragedy wasn't reflected in his art, some believe his style changed radically after her death. Carle himself lived to be 78; supposedly, he was even seen "racing as if he were a sprightly young man" just days before his death. Despite being well-regarded in his own time, this lively artist is unfortunately known today mostly as an aside in the lives of his father and his son. Larger versions: "The Shipwreck" and "Equestrian Portrait of Emperor Napoleon I"
"Feel Art Again" appears every Tuesday, Thursday, and Saturday. You can e-mail us at feelartagain@gmail.com with artist suggestions or details of current exhibitions.